This is what the Holy Virgin shows me on Her Immaculate Heart, it is a large scapular, larger than ordinary scapulars, it is a little larger than the palm of the hand. It is a pretty violet, nearly the color of a violet. Here is what is on top: -- in the middle are the three nails which crucified Our Lord on the Cross, they are placed above each other, not quite in the shape of the Cross, and at the point of each nail, there is a drop of purple blood. Above the heads of the nails, there is a kind of large sponge which has pieces of bark that stand out, it is a little like bales of oats. The three drops of blood join to fall into a small chalice painted red, and the chalice is surrounded by a crown of thorns, there are three little Crosses engraved on the front of the chalice. That is the side of the scapular which is on the middle cloak of the Holy Virgin. I notice that this scapular is held with two violet ties which go over each shoulder, there are three knots on the left shoulder and two on the right. The other side of the scapular represents the Holy Virgin Mary sitting, holding Her Adorable Son in Her arms, the mouth and the head of Our Lord rest on the heart of the Holy Virgin. At the bottom of the scapular, and nearly at the feet of Our Lord, is an Angel dressed in white, with curly hair; he has on his head a white crown, his belt is red. He holds in his hands a white cloth with which he wipes the feet of Our Lord. 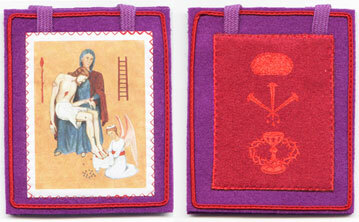 Next to the Angel, on the right side of the scapular, there is an engraved ladder. Behind Our Lord, on the left, is the reed of the Passion painted red, but there is no sponge. The tears of the Holy Virgin flow onto Her breast, to the right and fall to the feet of the Angel. The scapular is edged with a red band and the cords are made of wool. "Let Me now my dear child" the Virgin Mother said to me, "give you the explanation of this scapular. I am addressing you, My victim and My servant (most likely the spiritual director of Marie-Julie). "My children of the Cross, for a long time My Son and I have wished to make known this scapular of benediction. This scapular, My children, is modeled on My Heart, because My Heart is the emblem of simplicity and humility, which explains the color of violet. The nails which have pierced the feet and the hands of My Son are barely venerated and are venerable, that is why My Son, in His Divine Wisdom, has had three nails painted on the front of the scapular. "Those three drops of blood and the chalice represent the generous hearts gathering the blood of My Divine Son. The red sponge will represent My Divine Son drinking, in a certain sense, the sins of His children, but which His adorable mouth refuses. "I wish that the background (usually) black of the scapular should be violet, but I wish that the nails, the chalice, the sponge and the crown should be on a dark red piece of flannel. This first appearance of this scapular will be a new protection for the times of the chastisements, the calamities and the famines. All those who will wear it will be able to go through storms, tempests and darkness, they will have light as in broad daylight. Such is the power of this unknown scapular." --I hail Thee, Jesus crucified, to let me live. --I hail Thee with all the joy of the Angels and of the Saints on bringing Thee down from the Cross. --I hail Thee with all the sorrow of Thy Mother when Thou rested on Her Immaculate heart and on Her lap. "My children, very few souls think of wiping the adorable wounds on My feet when the blood flows and I wish this representation to be known. Little thought is also given to the tears shed by My Mother during My Passion: those tears are at the feet of the Angel who wipes My sacred feet. By this scapular, I wish you to think about that ladder, that reed and those nails of My Passion. "My children, any soul, any person who will possess this scapular, will see his family protected, his house will also be protected, firstly from conflagrations, which will never penetrate it. "This scapular will crush the ungrateful who will blaspheme My Name in the house where it will be exposed. If an impious enters, he will be so struck that his conversion will occur. All those who will wear it will be protected from thunder, sudden death and accidents. During the chastisements they will be protected. Whoever places it in the Holy Temple, will drive out the impious and the profanations. Our Lord also adds that by reminding an obstinate soul about this scapular at the time of death, it will reawaken in it faith and conviction, that all those who will think about it and love it, will be spared the pains of the soul, that those who will wear it will be sheltered from all danger as if they possessed Heaven. "And finally that this scapular will be like a lightning conductor beneath which the blows of just Divine Anger will not strike." Our Lord also says: -- "Any priest will be able to bless this scapular. You, My victim, will be able to make the model... While wearing this scapular the 'Crux Ave' may be said 5 or 7 times and meditate for 1 to 3 minutes on My Passion... I will grant great graces to those who will wish to wear this holy Habit." In her extraordinary relations with Heaven, the pious stigmatic of La Fraudais, Marie-Julie Jahenny received during the ecstasy of the 23rd of August 1878 a request for a new scapular. This scapular is an honored privilege offered by Our Lord and Our Lady to lead us through the terrible times when the world will face the Holy Wrath of God. So much blasphemy and iniquity on the part of man inexorably provokes Divine Justice, but at the same time, the infinite Goodness of Our Lord and of His holy Mother manifests itself to help, in the middle of the torment, those who, humbly, with good supernatural dispositions and without presumption put their trust in Them. Not only is the wearing of this scapular strongly recommended, but its exposition in our chapels and houses will give a very special protection.